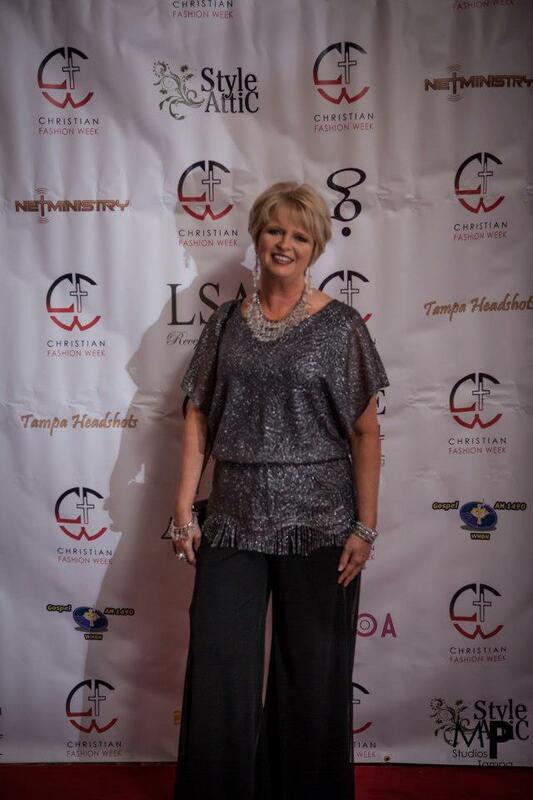 Christian Fashion Week was AWESOME! My friend Shari Braendel and I had such a wonderful time in Tampa last week. (You can see pictures of what I wore below.) Check out the printed black and white pants that are one of the latest spring fashion trends. The weather was in the high 70’s and not only was the sun shining but the Son was shining too! I know God must have been proud of these 4 amazing people (Jose & Mayra Gomez and Wil & Tamy Lugo) who had a vision for putting a Fashion Week together where designers were challenged to design entire lines for His people. The VIP Reception on Friday night was a great opportunity for us to meet these 4 visionaries who had worked so hard, with many other volunteers, to put this event together as well as meet Designers, Media Representatives and other Stylists in the the fashion industry. Some of which I am Facebook friends that I got the opportunity to meet in person. The Runway Show on Saturday night was a spectacular showing of various fashions from 8 designers. These included swimsuits, menswear and a bridal collection in addition to some very creative feminine designs. The designs were much like what you would see at New York or London Fashion Weeks but with modesty kept in mind – proving you can be very fashionable without showing a lot of cleavage. While many of the styles were probably a little more “creative” than what the average woman may wear, it proved that high fashion designs can be beautiful and modest. You can check out the Christian Fashion Week page on Face book http://www.facebook.com/ChristianFashionWeek?fref=ts to see photos of all the designs and festivities of the weekend. I also had the opportunity to meet and spend time with Sara Cribbs from Zondervan while I was in Tampa. Zondervan was a major sponsor of CFW and they had sponsored a contest for a lucky applicant to win a $500 shopping spree. How exciting it was to meet Lanee’ Nye, the winner of the contest, and be able to assist Shari as we shopped for a new wardrobe for her! I can’t think of a more deserving winner. With her $500 we were able to purchase 6 pair of pants, 8 tops, 2 pair of shoes, 3 necklaces and 3 pair of earrings. Do we know how to shop or what! Zondervan also has a line of very Fashionable Bibles from their Style Line Collection that is the perfect accessory for every woman. I have the silver clutch one below that is very convenient for me to carry when traveling. They also can fit in your purse with ease. I hope you are shining brightly this week!